I finally got around to posting my novel progress for the day. I ended taking the weekend off because we had friends in town and between hanging out with them and dealing with 3 little kids, I was pretty much worn out for most of the weekend. But I was back at it today, working through a rather longish Chapter 26. The chapter was made up of 3 scenes each of which I’d estimated at close to 1000 words. It results in a 2,755 words for me today, bringing my 29-day total to 59,088 words. I was happy with all but the last scene. That one will clearly require some work. But it looks like I’m about 4 chapters away from wrapping up Part 2 of the novel and that means that on Friday or Saturday, I’ll start into Part 3 which I’m really looking forward to writing. I’m still pushing to finish by about December 15, and certainly not later than December 20 since I don’t plan on taking the novel on vacation and I’d like to head out of town without the novel hanging over my head. 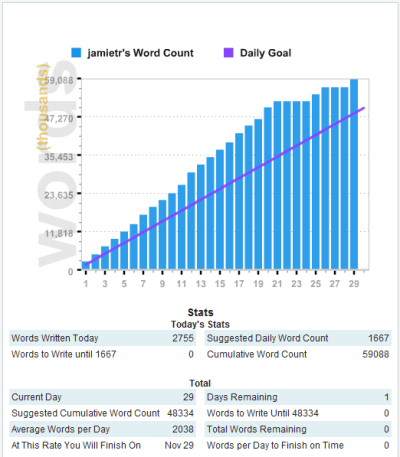 Tomorrow is the last official day of NaNoWriMo and after tomorrow, I’ll be writing a post on my experience with Scrivener 2.0 through this process, so stay tuned for that in addition to the usual stuff. I’ll also be posting about how much time I spent writing in the month of November which was a record-setting month for me.